It was such a joyous occasion, one Sunday in December, when whānau and friends of Hamuera Te Punga gathered at St John’s Lutheran Church, Halcombe to commemorate the ordination of Hamuera, 100 years ago, in Springfield, 1912. It was a day of whanaungatanga rooted in memories of Hamuera’s work, and his wife Lydia – whose musical influence was reflected in the robust part harmony singing, and a rendition of her unique version of the Lord’s Prayer. But what of the origins of the Lutheran Church in New Zealand? There are fascinating stories of the early Lutheran missionaries, who, although small in, number, made a huge impact on Pākehā-Māori relationships in the 19th Century as they worked to establish Māori missions. Come, begin this journey with me – through The Lutheran story : a brief history of the Lutheran Church in New Zealand, 1843-1993 by Jean A. King. 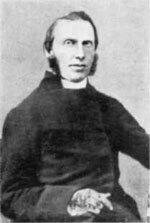 Missionary Johannes Gottfried Engst. Photographed in 1874 by William H Rau. Alexander Turnbull Library, Ref: PAColl-0058-10. 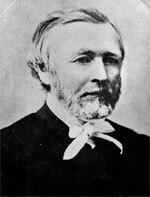 The Gossner Mission Society sent five young men – Oskar Beyer, Tohan Baucke, Johannes Engst, David Muller and Franz Schirmeister to Whakaru Bay, Chathams, in February, 1843. 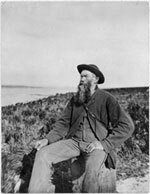 By 1850, it became clear that the mission was not viable, and, over time, only Engst remained on the island, where he died in 1910. In the South Island, New Zealand, land purchased by The New Zealand Company for its Nelson settlement attracted – through newspaper advertisements – a group of emigrants (mostly Lutheran) from North Germany and the Rhineland. The ship St Pauli arrived in Nelson, June, 1843. The North German Mission Society sponsored a second wave of missionaries to work with Māori, and on board the ship were two ordained ministers, Johann Friedrich Heinrich Wohlers and Johann Friedrich Riemenschneider, with two students, H. H. Trost and J.W.C. Heine. Wohlers feared for their effectiveness as they were entering a British colony, with British settlers, and he felt that they would be seen as intruders in the landscape. He was greatly disappointed to find very few Māori in that part of the Nelson area, and their early efforts to establish a base was also thwarted somewhat by torrential rain and floods. Ruins of the Rev. J.F. 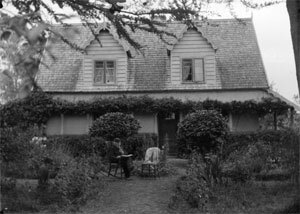 Wohlers’ house, Ruapuke Island. March 1895. Elizabeth Mary Hocken. Wohlers ventured south, and eventually founded a mission at Ruapuke Island, under the shelter of Tuhawaiki. The little community thrived until the opening up of the mainland. He died on Steward Island 1885. J F Riemenschneider turned to Taranaki with a Mr Wieghtman, toward the Mokau River, meeting up with Henry Schnackenberg who was at the Methodist mission station. He attempted to set up a base in an area populated by Māori catholics, but then, with the assistance of H H Turton, moved to Warea, in Taranaki where he fulfilled a number of roles – as doctor, judge, builder, cabinetmaker, agricultural worker, and advocate for Māori in local body, and an advisor to government on Māori land. His refusal to align himself with Māori, during the Taranaki Wars, 1860, however, caused a rift, resulting in his move to Nelson, and then Otakou Heads where he died in 1866. Reverend Johann Heine at the Lutheran parsonage at Upper Moutere. Heine, Clara Mathilde. Ref: 1/2-032576-G. Alexander Turnbull Library. J. C. W. Heine had been left to attend to the German settlers in Nelson, taking on roles of teacher and pastor. He sold the NZ Company land in Nelson, purchasing a base in the Moutere, Waimea, Ranzau area. And he named his settlement Sarau. Heine approached the Hermannsburg Mission Society for help with finances and personnel for both a Māori mission and for the German Lutherans. Portrait of Rev Johann Heinrich Christoph Dierks. Taken by William Henry Thomas Partington, 1854-1940. Ref: PAColl-5871-05. Alexander Turnbull Library. Firstly came C F Meyer (from Adelaide), then Christoph Direks, H W Kower, H Loose and J F Goessling, 1876. Christoph Dierks (Waitotara) and his brother Hartwig (Maxwelltown) were the most successful in working with Māori. Pastor G Blaess worked in the area of Parihaka until 1906. Although Te Whiti and Tohu did not allow their people to attend his services, they did allow them to attend “singsongs” which the musically gifted Blaess organised. Pastor Blaess met with Hamuera Te Punga, of Waiwhetu, and asked him to translate the Lord’s Prayer, and Luther’s Small Catechism into Māori. 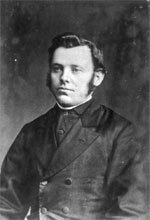 Hamuera was encouraged to study for the ministry and was sent, with Henry Harting to a Lutheran Seminary at Springfield in United States. Hamuera married Lydia Gose, and returned to New Zealand in 1912. After working in the Lower Hutt area, Hamuera was invited to the St Johns Lutheran Church at Halcombe where he remained until his death in 1968. King, Jean A. The Lutheran story : a brief histoy of the Lutheran Church in New Zealand 1843-1993. Lutheran Church of New Zealand, 1994. God’s messenger : J.F. Riemenschneider and racial conflict in 19th century New Zealand / Peter Oettli.